La note a été taggée English, Mac OS X, modem. Few days ago, I saw the movie Wargames. And a little later , I saw a presentation introducing a guy who logged on with an acoustic modem dated from the ‘60s. If I did not find a modem that old, I still finally found an acoustic model that dates from the early ’80s. In the early ’80s, a frequent modem was the Novation CAT, sold on other brands like Apple (for Apple II), Atari, etc. In my case, I found a RS Coupler 9201 , which is a priori a clone of the Novation CAT. The funny point is that I got mine in its original box, including the “driver” for the computers of that time (IBM PC, Atari, Apple II, etc.) : a few pages of BASIC for each machine to enter manually. The modem has the advantage of providing an outlet still usable with a modern computer : a DB25 serial connector. The modem communicates in RS232, so I bought a USB to RS232 adapter (models based on PL2303 work well) and a DB9 to DB25 cable. For the modem part, I made it simple : a desk phone, a phone line simulator and a Raspberry Pi equipped with a modem. This setup is the same , with some software differences, that the one used to connect a Palm to the Internet. You will need, on the Mac side, to change a login script into Null Modem to set the speed to 300 bauds on the modem settings (2 parity bits , which is unusual). This is where things get complicated : at 300 baud, it is almost impossible to use PPP. Even setting MTU and MRU at very low levels (128 bytes, and 40 for the TCP/IP signaling), the connection is made very rarely. And even in this case , it is simply impossible to make a simple ping or (worst) to open a webpage. 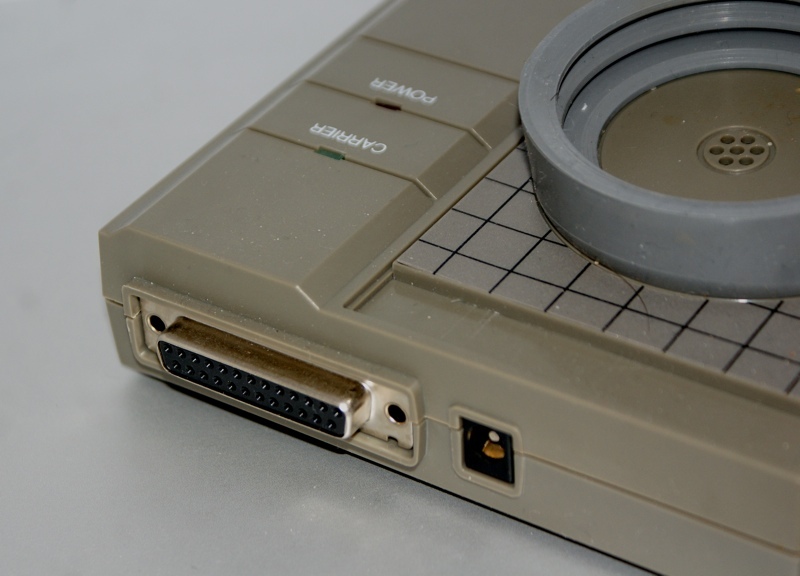 In theory, SLIP can be used to make IP on a serial link, but Mac OS X no longer includes the tools since Leopard, and even under Leopard I was not able to open a connection on my serial ports, whether with a USB to RS232 adapter or with the serial port native of a Xserve G5. What works however is a simple serial connection between my Mac and the Raspberry Pi : a session can be opened on Raspbian by connecting with Zterm (for example). The operation is simple: the Raspberry Pi modem is connected to the line simulator on one side and the phone to the line simulator on the other side. Then, as shown in the video, dial the number on the phone, place the handset on the acoustic modem, and wait. The modem will manage the connection, then simply run a serial connection from the Mac to open a session on the Raspberry Pi. Then, it is even possible to surf using Lynx (a text-mode browser) on the Raspberry Pi. It’s terribly slow, even to load retro.hackaday.com, but it is possible.